Dayton Attorney Susan Deaton lives in Centerville, Ohio and practices law in Kettering, Ohio. Susan graduated from Wright State University, where she studied Mathematics and Sociology. Ms. Deaton attended the University of Dayton School of Law, where she earned her Juris Doctorate (J.D.) in 2016. 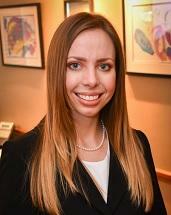 Now Susan works as an Associate Attorney at Hartley Law Office, LLC, in Kettering, Ohio. Susan chose to practice Family Law because she has always been passionate about helping people, and she understands that matters of family law and divorce are some of the most difficult events a person may face. Susan considers customer service, attention to detail, empathy, and maintaining open lines of communication to be of the utmost importance. She strives for precision and excellence in obtaining the best possible results for her clients. Susan is a member of the Ohio State Bar Association. Outside of her practice, she enjoys bicycling, knitting, reading, and spending time with her family. Attorney Deaton focuses her practice on Family Law, Child Custody, Divorce, Fathers' Rights, Grandparents' Rights, and Marriage Dissolution. She is pleased to serve the communities of Centerville, Dayton, Kettering, Moraine, and Oakwood, as well as the greater Southwestern Ohio area. If you face a significant Family Law or Divorce Law Issue, need experienced legal representation in Dayton or Kettering, Ohio, and would like to schedule a confidential, initial consultation: contact our office at (937) 312-9130 or by using our online contact form. Please be advised that, upon request, evening and weekend appointments are generally available.